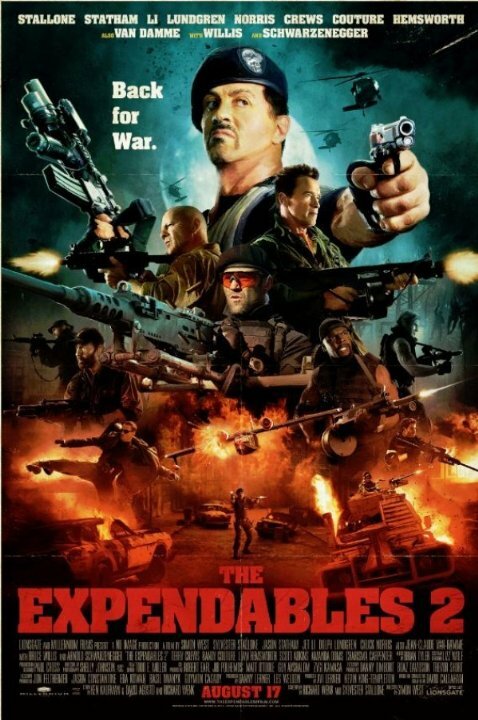 After finding the original Expendables a total disappointment I had to say I was really leery on the idea of a sequel happening let alone watching it. On that note I finally sat down last night and watched Expendables 2 and it was so much better and I really had a good time watching it. I don't know if it was cause Sly decided to hand the directing job over too Simon West (Con Air, The Mechanic(2011)prod. on Black Hawk Down) and went with focusing on the screenplay and acting? Or this time round's casting which included a couple more of my fave 80's action heroes Chuck Norris and Jean-Claude Van Damme (Who I thought nailed the bad guy role in this and should do it more often) Sly's hiring or getting them back to work of these old stars is what intrigues me about these films in the first place. A lot of people poo-poo these films as saying such things as ' OMG they are all so old!!' etc. I personally don't care as I loved these guys to death back in the day and don't see that changing anytime soon. At least until there are some new age action heroes to take their place. Aside from the always awesome Jason Statham (Who is also in this b.t.w.) that is. This time round after taking care of business in Nepal, the crew head back to New Orleans with new recruit Billy The Kid (Liam Hemsworth) in tow, it's not long before crew leader Barney Ross (Sylvester Stallone) hears a couple of bad news items. First Billy The Kid wants to leave all this action and go back home to his girlfriend and also Cia correspondent Mr. Church (Bruce Willis) is forcing yet another mission down their throats where it seems they have to go to Albania and retrieve an important package that is in a safe in a plane that crashed somewhere there. Church also advises them not only that they have to do the mission but they also have to play babysitter to technical expert Maggie Chan (Yu Nan) who will be accompanying them along the way. Upon arriving and getting the package which turns out to be a map of a mine in Albania that apparently is filled with plutonium, it's not long before main protagonist in the film Jean Vilan (Jean Claude Van Damme) along with his hired hands known as the Sangs take the plutonium map from Barney and his mercenaries . The crew ask Barney what to do as to which he replies "Track em' Ketch em n kill em!!" Game on!!! The entire movie is of course loaded to the brim with action with hardly any dull moments. I also loved the comedy bits of movie taglines that made all these stars famous in the first place being used by that exact star now and then through the film. Trench (Arnold Schwarzenegger) says "I'll Be Back" countless times along with brilliant Chuck Norris anecdotes, in one of my favorite scenes after blowing away a whole platoon of Sangs that were shooting at Barney's crew all by himself Ross states to him "I thought you were dead, killed by a cobra?" as to where Norris's character Booker replies "Yup I was bit by the cobra and after 5 days of long pain and suffering the cobra died" Lol perfect! If you don't like action films or excessive violence (excessive although fun) or a class reunion of 80's action stars and a film filled to the brim with priceless clich�'s then this film is not for you. If you were like me and hated the first chapter the second act redeems itself and then some!